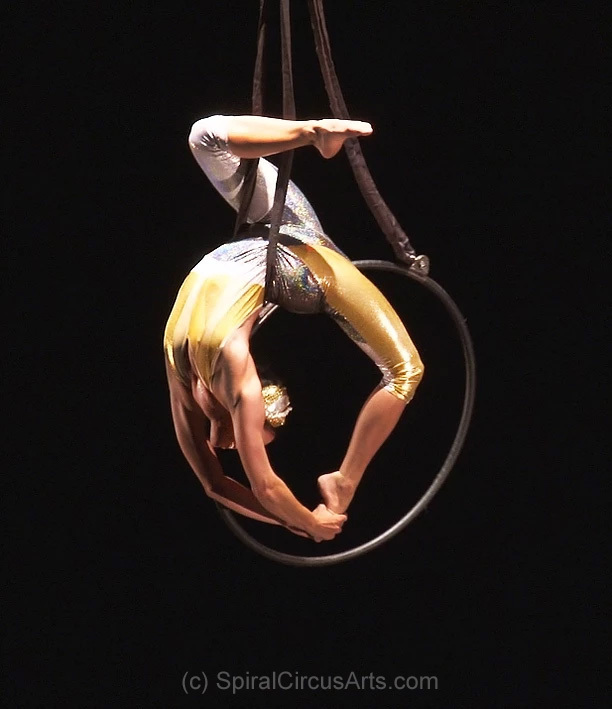 Dancer, acrobat, flow artist, Vivian Spiral of Spiral Circus Arts, elegantly bends herself backwards to mirror the lyra (aerial hoop) suspended next to her. Stunning! I can barely touch my toes bending forward. She epitomizes the beauty, grace, and flow of body movement. See her in action in the video below (about 3:30 in you see go into this pose). Kissed by stardust from the rings of Saturn, Vivian became Spiral and developed an uncommon affinity and passion for circles and revolutionary motion. Thereby inspired to create a unique, mesmerizing style of dancing with hoops, she became known as a pioneer of contemporary hoop dance. Equal parts Sorceress, Acrobat, Dervish, and Ninja, she brings the kind of tingle to the spine that can only be wrought as a direct result of tireless training, incredible skills, and occasional conspiracy with otherworldly forces. Spiral has been on the cutting edge of hoop dance and flow arts for over a decade, setting a precedent for skill, precision, and artistry that is unparalleled.